We’re back from our first RV vacation. Traveling free as gypsies is liberating and extremely fun. Yes, at times it was a little tense but oh so worth it. We slowly drove down the east coast of USA, all the way down to St Augustine, Florida in search of warmth. Traveling with two dogs, one weighing 170 pounds and the other a nutty hyper active five month old puppy (with a broken leg) is just madness. They don’t get along at the best of times. In a small confined space it was intolerable. Molly was always in the way. When she eventually did lie down, she stretched all the way from the driver’s seat, through the living room and into the kitchen. Imagine trying to cook dinner when you have to step over the dog every two minutes. Molly wouldn’t eat. Libby would not stop eating Molly’s food. They both always wanted out and had to be walked separately. It’s a miracle I didn’t break my neck on those steep motor home steps; both dogs pulled so badly on their leashes scrambling to get outside. 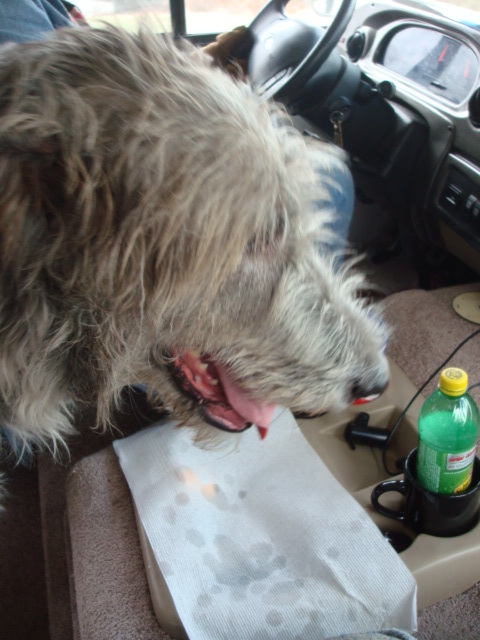 Molly our Irish Wolfhound still hates to travel. For the most part she stood, panting the whole three weeks. We ended up putting down a piece of paper towel to absorb her drool. Help! This space on the couch is occupied. Move! Favourite beach: Hatteras Island, Outer Banks of North Caroline. The colours were so soft and beautiful with the lovely grays, tans and blue. I loved the vistas of endless sky, sand dunes and sea oats. 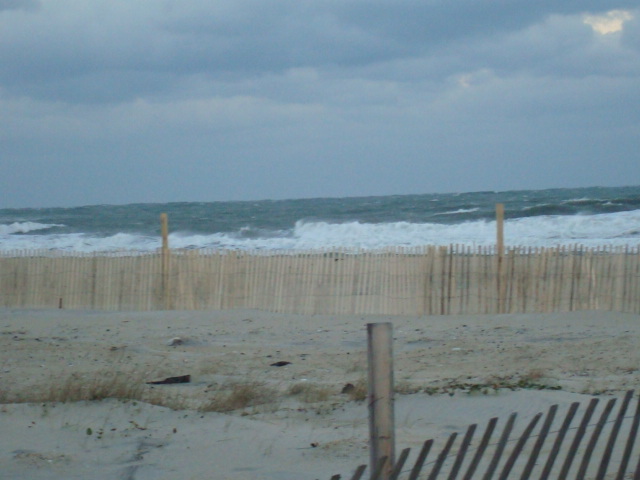 We camped right on the sand dunes in Rodanthe and the Atlantic Ocean roared all night. Unfortunately the wild gusty winds increased the next morning. We had a scary drive off the island. My fearless husband had to crank the steering wheel 15 degrees just to hold our rig on the road. 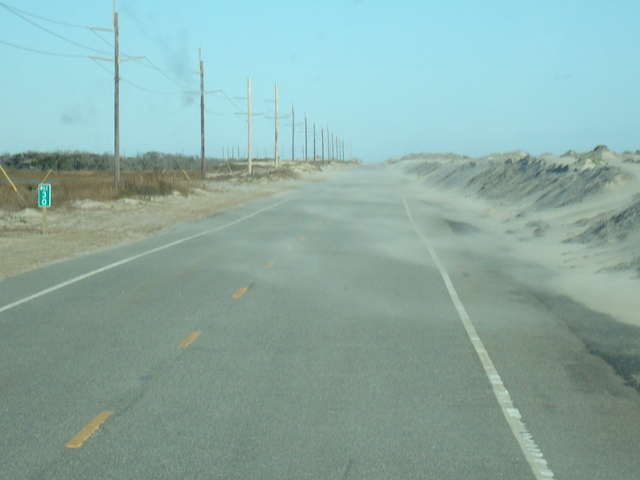 At times the drifting sand covered the highway just like whiteouts of snow. More things I didn’t like: To get off Hatteras island we had to take an enormous towering bridge – the longest bridge in North Carolina. This bridge was 5.3 miles long and a scary 65 feet high above the water. The crazy wind conditions continued to pound and rock our RV all the way across the open water. Second scariest bridge: The Chesapeake Bay Bridge–Tunnel is a 23-mile-long leading into Virginia Beach. While talking about scary things, I also don’t like to drive through major cities on freeways, especially where there are construction cones and barriers. We barely fit and every time Warren veered to the right to avoid a mammoth transport truck overtaking us on the left, I leaned my body in to avoid hitting the construction barriers set up on the right side. As a matter of fact, on our first day we smashed and took out the arms of our outside awning driving through a narrow stretch. Sand spurs – Oh I hate those nasty, horrid prickly things. They stick their sharp bristly spines under your skin and are very painful to remove. Poor Molly had them clumped to her paws after we walked on the sand dunes. I also tasted the famous coconut cake at the Peninsula Grill in Charleston. A friend told me this was a “Must Do”. It is suppose to be the “ultimate best tasting coconut cake in the world” The restaurant was expensive and we weren’t dressed properly but they offered take out. At $7.00 a piece, I found it a little dry but I’m glad to have tried it. 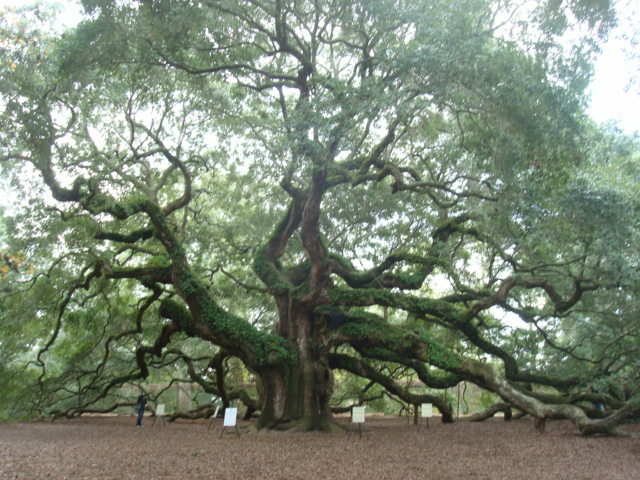 I loved the Angel Oak Tree in Johns Island – outside of Charleston. It is a truly beautiful elegant old live oak estimated to be 400 – 500 years old. It’s huge and its graceful long limbs hang down and trail along the ground providing cool shade for 17,000 square feet. Savannah is as charming as ever. My absolute favourite city. One afternoon we rented an electric car and zipped around Tybee Island sightseeing. Best afternoon was spent in a bar, just off the beach scoffing down fresh steamed shrimp. munch munch slurp. Oh ya. I loved the cozy feeling we had every night as we settled in. Our blinds would be down, the TV on and all four of us would be safe and together. No dog kennels for us. We stayed a family. I loved that. I also loved seeing the world through the enormous front windshield. What a view. It was also really comfy sitting in the passenger seat with lots of leg room. I could drink all the coffee I wanted knowing a washroom was only twenty feet away. Feel like a snack? No problem, the kitchen was right there. It was a very enjoyable way to travel. Not so enjoyable is traveling in a motor home in the northern states, during the winter. We disconnected our water lines in Pennsylvania and New York. We have water in large jugs and heated this up to wash. It was such a bother for two days. I was glad to finally get through that. It was too much like real camping for my style. The fact that the trip was a success was entirely due to the efforts of Warren. He worked hard the whole time. Before the trip he ripped out the old kitchen table and maximized the floor space for Molly. He also extended the length of our bed. We slept like kings with a comfortable new mattress and soft linens. Warren was a quick study learning the ropes of RVing. e.g. hooking up, draining holding tanks, and programming the GPS. RV camping with Warren is seamless. 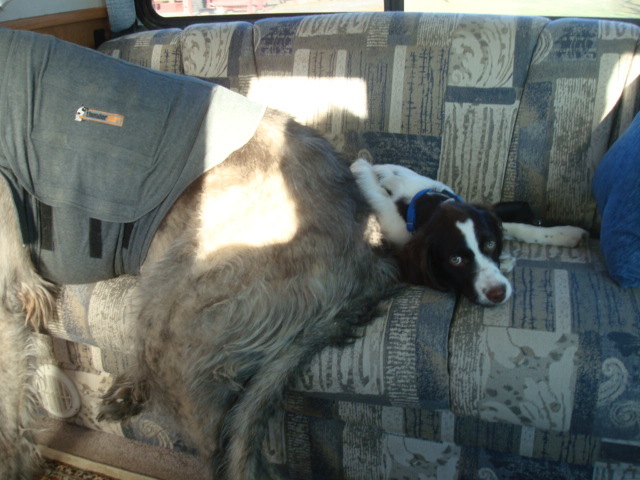 This entry was posted in Family matters and tagged RVing with dogs. Bookmark the permalink. 8 Responses to Our awesome RV adventure. We’ve been talking about the possibility of getting an RV after several miserable camping trips, but I worry so much about the actual driving and it sounds like I should be! Welcome back!